With over 5,000 customers and 80 employees, the company generates 40 percent of its revenues through channel partners in all parts of the world. Cyberscience focuses its North America direct sales efforts in the manufacturing vertical, although it has customers in the finance, distribution and automotive industries too. Key partnerships have also propelled strong visibility in the healthcare arena. A starter package for five users costs about $20,000, and recommended training comes extra. Cyberquery is an enterprise query and reporting platform that delivers business intelligence to a range of companies, from startups to Fortune 100s. The company’s native database makes it easy to abstract transactional tables, simplifying data access for non-developers and optimizing response times when querying large data sets. 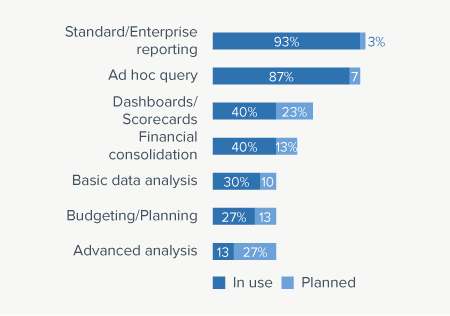 Average business users can build reports, charts and visualizations, but the tool is ideal for power users who want to iteratively query operational data and build operational reports. Cyberscience has had four decades of success with core operations reporting and analysis with proven QAD, Infor and Epicor database connectors. And the company continues to invest in and develop platform enhancements that improve ease of use and expand functionality. Cyberquery is used for a wide range of operations reporting, including building financial statements and merging visualizations into management reports. While the company’s own sales team addresses the manufacturing segment, approximately half of Cyberscience’s revenue comes through resellers, including partners in APAC. 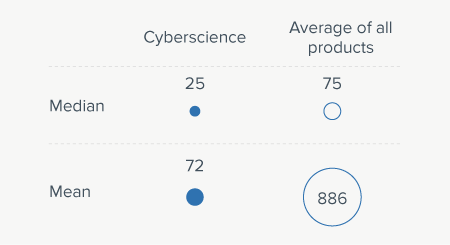 About two-thirds (66%) of Cyberscience’s customers have between 100 and 2,500 employees. These customers have fewer resources than large enterprises and have given Cyberscience above average scores for deployment, measured in The BI Survey as ‘Project length’ and ‘Project success’. The BI Survey reports a median of 25 users per customer site and a mean of 72. Customer penetration is 15 percent, 2 percent lower than the average of all products. The dominant use cases for Cyberscience are standard/enterprise reporting and ad hoc query. 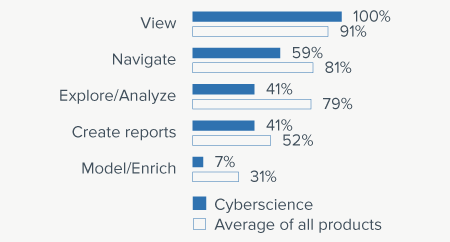 Forty percent of customers also use Cyberscience for dashboards/scorecards and financial consolidation, and all survey respondents use Cyberscience to view reports and data. In addition to Cyberscience’s offering, customers often evaluated IBM Cognos Analytics, Microsoft SQL Server Reporting Services and Power BI, SAP Crystal Reports and IBM Planning Analytics. BARC’s Vendor Performance Summary contains an overview of The BI Survey results based on feedback from Cyberquery users, accompanied by expert analyst commentary.